Last week we spoke with Zetta Elliott (A Wish After Midnight) about her experience working with AmazonEncore, a new venture from Amazon with this motto: "Unearthing Exceptional Books and Emerging Authors for More Readers to Enjoy." Born in Manhattan and raised in Hong Kong, Andrew Fukuda is half-Chinese, half-Japanese. He received a bachelor's degree in history from Cornell University and went on to work in Manhattan's Chinatown with immigrant teenagers for a number of years, an experience that led to the genesis of Crossing. He currently resides on Long Island, New York, with his wife and two sons. Crossing is the story of Xing Xu, a Chinese teenager growing up in a small town in upstate New York. ALA Booklist gave the book a starred review, calling it "Sad, elegant, creepy ... a deft debut." I wanted to find out more about how and why Andrew decided to pursue this new, non-traditional route, so I focused my questions on the nitty-gritty of publishing (again, emphasis in bold is mine). Welcome to the Fire Escape, Andrew. Let's start with getting published. What was your experience trying to get this book published before AmazonEncore? It was a test of endurance. Quite a few publishers showed interest but ultimately declined in the eleventh hour because of the dark tone of the novel and what they perceived to be some marketing challenges. Crossing isn’t exactly an easy-to-categorize YA novel, after all. It’s an unconventional crossover YA novel featuring a male protagonist (strike one) who is Asian (strike two) in a plot line that doesn’t feature any vampires and/or fallen angels (strike three). And it doesn’t fit into a conventional Asian YA novel, either: no ninjas here, no cathartic returns to the motherland, and not a flying dragon in sight. Other than literature-loving immigrant Asian teenage boys (there are about two nationwide), who was going to read this book? 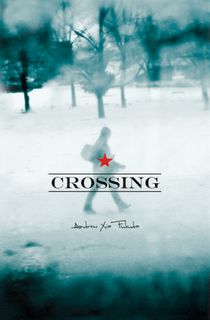 Crossing’s strengths – its unconventional plot and unique protagonist – were ultimately perceived by many publishers to be a marketing Achilles Heel. That is, until AmazonEncore came across the manuscript and recognized that it was a novel that spoke of themes with universal appeal. What was the editorial process like for Crossing? What was AmazonEncore’s role? AmazonEncore was very hands-on in making sure that the finished product was something both it, as a new imprint in the publishing industry, and I would be proud of. To that end, while giving me generous discretion as to the literary vision of the book, AmazonEncore dispatched top-tier copyeditors who meticulously edited the manuscript at least twice before publication. Terry Goodman, the indefatigable senior editor at AmazonEncore, also outsourced cover-designing to a stellar media firm that designs the cover for many bestselling books. Terry sought my input about the cover, making sure that he understood my thematic preferences. In the end, three cover concepts were presented, all wonderful, each reflecting in different ways my input. How does publicity work for AmazonEncore Books? What do you do? What do they do? Here, again, AmazonEncore really showed its mettle. Although a new imprint in the publishing industry, AmazonEncore was able to exert a marketing full-court press that other imprints – lacking the significant resources afforded by the Amazon brand name – would have difficulty matching. For example, AmazonEncore’s marketing department mailed Crossing ARCs to hundreds of media outlets, put out timely press releases, placed promotional advertisements in relevant magazines, and even put together a book trailer for Crossing. And its ability to promote Crossing on the Amazon website is, obviously, something even the biggest publishers would find difficult matching. In addition, demonstrating that it is as personal as it is professional, Sarah Tomashek of the marketing department worked on an individual basis with me, keeping me in the loop of the marketing campaign and giving me invaluable tailor-made advice regarding things I needed to do, e.g., setting up an author website. An example that really highlights both the professionalism and personal touch of AmazonEncore was when we realized that May was the Asian Pacific American Heritage Month, a commemorative event that would open up significant doors for Crossing. Suffice it to say, AmazonEncore bent over backwards to ensure that Crossing would be published in time for Asian Pacific American Heritage Month. What are you working on now, Mr. F.? At the moment, I have the opposite of writer’s block: two stories have tumbled into my head and heart, and both, apparently, are jostling to be written before the other. They are completely different genres involving drastically different writing styles: one is literary romance (this caught me by surprise) and the other is a YA novel with a neat spin on the dystopian genre. It’s a bizarre experience; if I spend too much time on the one, I feel unfaithful to the other. Both are flowing so well that I dare not put either aside out of fear that that might somehow dry up the creative stream.